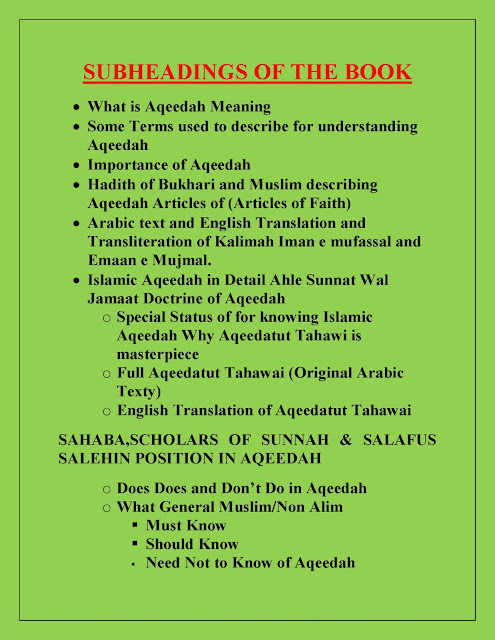 Islamic Aqeedah will be derived only from two sources. The issue about AHAD Narration in the matter of Aqeedah is an issue among scholars. Answer taken from here. Question: Could you please explain the difference between Ahad and Mutawatir Hadith? In particular, could you specify how many narrations make a Hadith Mutawatir? Also, are Ahad hadith taken into Aqeedah or only Mutawatir? AHadith Mutawatir (continuous) is that which is related by whole groups of individuals from whole group of individuals, in multiple contiguous channels of transmission leading back to the Messenger of Allah (Allah bless him & give peace), such as that the sheer number of separate channels at each stage of transmission is too many for it to be possible for all to have conspired to fabricate the Hadith. 1It is reported by such a large number of narrators that under normal circumstances it would be impossible for them to conspire a lie. 2Such a number exists throughout the chain of narration, i.e. from the beginning to the end. 3The reporters must base their report on sense perception, i.e. on something that is heard or seen. 4That the narration necessitates certain knowledge for the listener. (Ibn Hajr al-Asqalani, Sharh Nukhba al-Fikr, P.21). "Whoever lies about me deliberately must prepare himself for a place in the fire of Hell" (Sahih al-Bukhari & Sahih muslim). Imam an-Nawawi (Allah have mercy on him) states that this narration has been narrated from approximately 200 Companions (Allah be pleased with them all) (Introduction to Sahih Muslim). The Ahad or solitary Hadith (also known as Khabar al-Wahid) is the Hadith which fails to fulfil the requirement of Mutawatir. Ahad Hadith may be sound (sahih), good (hasan) or weak (Da'eef). It is a Hadith which does not impart positive knowledge on its own unless it is supported by extraneous or circumstantial evidence. According to the majority of the four Sunni schools, acting upon Ahad is obligatory even if Ahad fails to engender positive knowledge provided certain conditions are met. 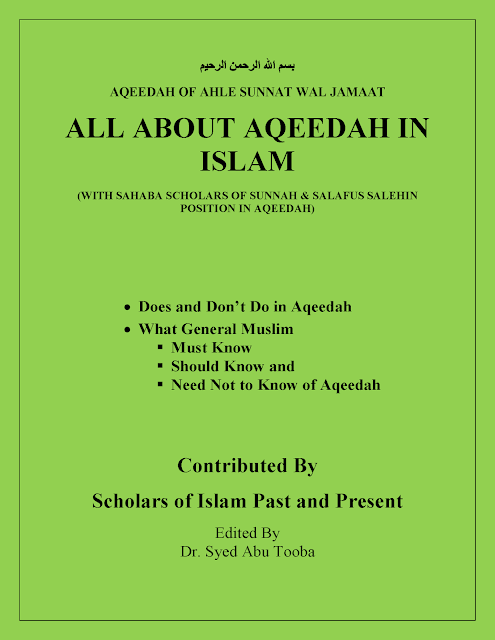 As far as establishing matters of Aqidah is concerned, the majority of the scholars are of the view that Ahad may not be relied upon as the basis of belief (aqidah), for matters of belief must be founded in certainty. Therefore, issues that revolve between belief (iman) and disbelief (kufr) can not be proven by Ahad narrations (Fawatih al-Rahmut, 2/136). However, this refers to beliefs on which the actual Iman is dependent. As for Ahad narrations pertaining to subsidiary matters which are not essential to belief such as intercession (shafa'ah), etc..., these must be accepted and believed. Anyone who denies them is a sinner (fasiq) but not a Kafir, as he denies something which is not decisively proven (Abu Zahra, Usul al-Fiqh, P.85). None of the previous scholars rejected any belief that was not established by Hadith Mutawatir. In fact, the great Hadith expert, Ibn Hajr al-Asqalani (Allah have mercy on him) states in his monumental commentary of Sahih al-Bukhari that, Ahad narrations are a source of evidence when the Ummah accepts it and acts upon it. It then has the power to become firm belief (Fath al-Bari, V.13, P.234). Many beliefs have been established by Ahad narrations, yet they have not been rejected by the great scholars of this Ummah. Beliefs such as the intercession (shafa'ah) of the blessed Messenger of Allah (Allah bless him & give peace), descriptions of the angels, Jinn, Jannah, Jahannam, and much more. In conclusion, matters of Aqidah can and have been proven by Ahad narrations and accepted by the majority of the Ummah. Yes, those integrals of Aqidah on which an individual's Iman depends can not be established by Ahad narrations. As a result, denying beliefs that are proven by Ahad will not constitute Kufr, rather a sin. Following is not Source of Aqeedah. 2. Any Analogy Logic, interpretation or Ruling Whatsoever. 3. Any interpretation based on any Story/story itself of Aulia Allah even if it is authentically proved. 4. Any interpretation based on Kashf/Karamat or dream of Aulia Allah. Few Important Points to be understood. 1. For Fiqh (Islamic Law, Jurisprudence) There are four Sources of Islamic Law. 2. The weak Hadith cannot be used for Aqeedah but will be used for Virtues (Fazail) and Targheeb o Tarheeb e.g for encouragement for a good work or warning for a bad action. Slafus Salehin Scholars including Imam Bukhari Rahimullah and Imam Ibne Taimmiya Rahimullah and others have used weak Hadith in Virtues (Fazail) e.g Imam Bukhari’s Al Adabul Mufrad Imam Ibne Taimmiya and but for Aqeedah the weak Hadith will not be used .But they will not be source of Islamic Aqeedah. 3. Aqeedah can never be derived from any interpretation direct or implied based onKashf/Karamat or dream of Aulia Allah. Even Rule of Fiqh (Jurisprudence) cannot be derived fromKashf/Karamat/Dreams. Karamat or Kashf of the Aulia Allah (Friends of Allah) are possible and to be accepted even if it looks impossible because Karamat and Kashf are by Allah power and will and for Allah nothing is impossible. The base line is it should be authentically reported. But as these are only historical facts. And for recording and narrating of historical fact there is no strict regulation (compared to very strict regulation is for Hadith) so proving any Karamat authenticity beyond doubt is very difficult. Similarly if any historical fact comes with reasonable evidence it can be acceptable and altogether rejecting it will not be acceptable to many. In summary no one should stress much on for or against of any historical fact of Karamat or Kashf. But the baseline is that Karamat/Kashf/Dreams of Aulia Allah will not be a source of Islamic Aqeedah to prove or disprove any belief of Islam. Also dealing with Salafi-Sunni difference on Waseela. · There are three things 1.Dua 2.Waseela.3.Shirk There understanding. · Quran Ayats and Translation that give light on Allah power and way of doing things. · No difference among scholar on 3 types of Waseela. · The difference of opinion among scholars on 4th type of waseela. · 1st group of Ignorant Muslims Who oppose Waseelah without understanding and brand waseela as shirk. · 2nd group of Ignorant Muslims who misuse waseela and do Rituals at grave of Aulia Allah. · Some common point on waseelah that all scholars agreed. · Example of king-minister or ladder to reach is totally wrong to explain waseela. · Ahadith that support 4th Type of Waseela. · Position of those who argue that 4th type of waseelah is not Permissible. · Some Wrong practices on the name of Waseela. · Among Muslim group Polemicists Waseela and Tawassul is one of the most commonly debate topic on internet forums/face book. or even totally wipe out the true influence of the work. To start any good idea or movement is difficult But to safeguard these Ideas and movement from loosing it path is more difficult. After dealing these sectarian issues for last 3/12 years it is becoming apparent that salafi Movement is passing through that phase. It is a right time for Salafi movement for introspection and this movement is in urgent need that Great Salafi Scholars should come forward to control the Salafis Flag bearer Youth to control further damage to their Movement and Damage to the Islamic Fabric caused by activities of misguided elements on the name of Salafi Dawah. Obviously these misguided Youth has nothing to do with Salafi Ideology and no True Salafi is endorsing them.But so many subdivision among salafi so very difficult to know the true Salafi. Still bigger problem is that these youth have become public interface and contact of Salafi Movement on internet. Some of the key areas where these Youth needs proper Knowledge. 1.Please be clear these youth who are being described below constitute a good part of those who identify them as salafi on internet. 2. But they have nothing to do with true Salafi/ Salafi Ideology . 4.They are simply misguided youth having a name of salafi/Ahle Hadith and doing nuisance on the name of true Islam. 5.May Allah save Muslims from this Fitnah.